Sand is the stuff of which Long Island is made. Through sand, you can enter the world of the very small and the very large. Look deeply into the realm of these tiny grains and find sparkling fields of jewels. Step back and explore a beach, dune and desert. Sand is a slate on which wind and waves write the story of our planet. Most of all, sand is fun. It's soft to the touch and inviting to walk on. It's a place to dig and build. Sandy Island was, at the museum's opening, a 1.500 sq. ft. gallery exploring SAND. Scroll down to take a look at some components. 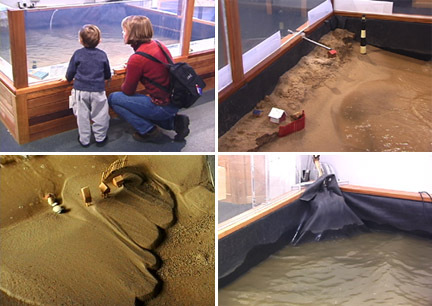 a hands-on laboratory in which kids and grownups experiment with the dynamic relationships of waves and sandy shorelines. a challenge for both "waveMakers" and "beachMakers". At one end of the 12' x 12' tank, kids fortify the shoreline with a variety of devices: jetties, groins, bulldozers, scrapers, seawalls, bulkheads, breakfronts, sand walls, trenches, etc. Small houses placed or implanted (with stilts) provide another challenge and a sense of scale. At the other end of the tank, "waveMakers" augment a slow steady motor produced wave train. Their goal: to alter the beach. A frame-grabbing computer records time-lapse movies of the events taking place in the tank, playing back the last hour. The action is controlled by the user and makes visible some of the dynamic transformations within the wave tank. This looping sequence is a four hour stretch of time lapse footage showing the formation of a barrier beach which grows from an eroding cliff and stretches out towards the "lighthouse" in the lower right corner. SANDY ISLAND > BEACH WORLD, a second computer installation paired with the wave tank, offers a library of time-lapse movies showing changes in real-world beaches. 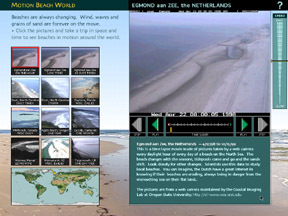 Another section of the program provides interactive screens describing the dynamics of waves and sandy shorelines. SANDY ISLAND > SLIM WAVE shows a cross section of a beach and demonstrates the effects that different kinds of waves have above and below the water line. A variable speed motor drives a wave paddle on a cam. 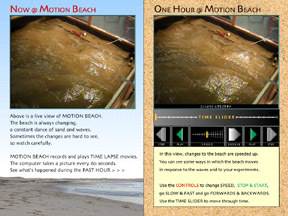 The user sets the speed and can observe the rapid change of a mini beach and formation or leveling of offshore sandbars. BOULDER DROP breaks rocks into sand. Screens below the rocks sort the smaller pieces by size. 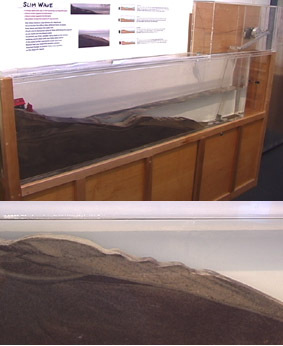 The bottom compartment contains the sand that visitors have produced since this device was set in motion. Pull up the iron ball with the rope handle. Let it go and watch the ball crash on the rocks below. SANDY ISLAND >DUNE - Two air blowers produce a user-controlled stream of wind blowing across a sandy bed. The patterns forming inside are the result of the different ways individual grains behave as they move across the surface. 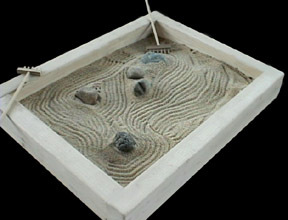 The ripples in the sand chamber are miniature sand dunes. You can find sand dunes and ripples at sandy beaches and dry deserts. Dunes come in different shapes and sizes. Some are shaped like crescents, some line up in neat rows and march in the direction of the wind. When the wind comes from many directions, some dunes swirl around like stars. 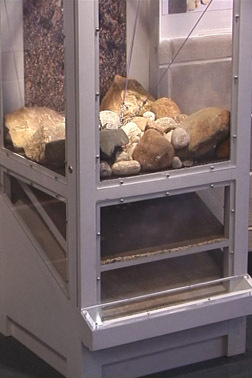 is an interactive software installation with dozens of screens, movies and demonstrations about the local geology of Long Island and the broader geology of SAND. 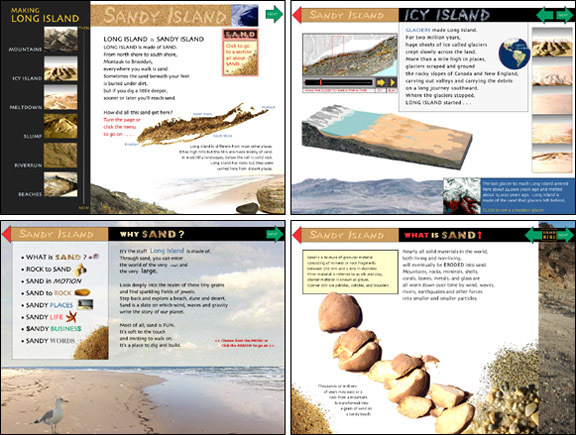 SANDY ISLAND > JEWEL BOXES - CD jewel boxes contain sand from all over the world, gathered by myself and friends. It should be clear from the wide range of samples that sand is one word but it's not one stuff . 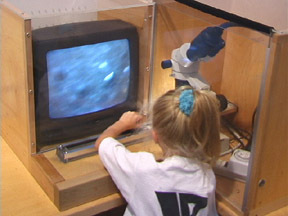 . .
A video microscope provides visitors with a means of LOOKING CLOSER. A dozen samples arranged on a slider are matched to location and content descriptions. 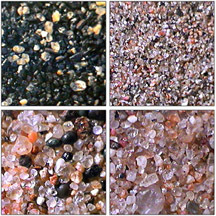 Microphotographs of different sands augment this hands-on workstation. A nearby table provides another view with a large map of Long Island, samples of local sands, and multiple 10X hand lenses. MAGNETIC FOREST - Slide the handle. Look through the magnifiers and watch the dancing sand. The black sand grains are MAGNETITE, a mineral rich in iron. The handle has a magnet attached. Magnets attract iron. 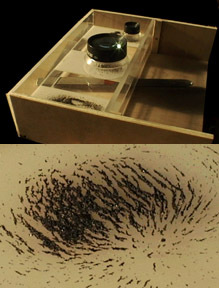 The magnetite patterns you see are the lines of force of a MAGNETIC FIELD. When a magnet attracts a magnetite grain, it magnetizes the grain which, in turn, attracts other grains which become magnetized and attract other grains and so on and so on . . . We collected the magnetite by dragging a magnet across the beach at Fire Island. 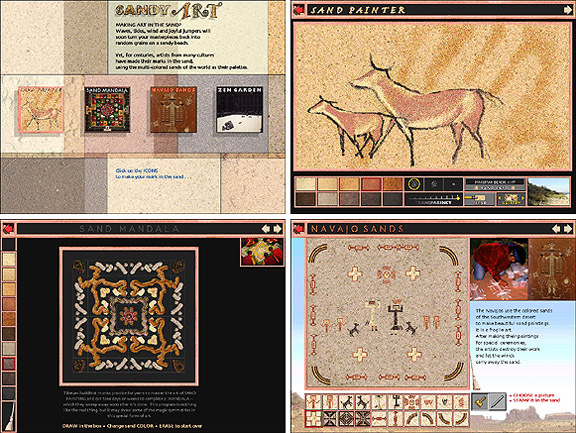 is a computer installation providing a set of interactive tools with which visitors can draw in various modes simulating the uses of sand in different cultures. . . . much easier to do with silicon chips rather than real silicon. The kiosks protect iMacs with all controls (and keyboard) accessible through a sliding drawer. We used optical mice rather than trackballs to avoid sand clogging.